The N82 and E71 were both worthy devices, and the N97 will surely be significant, but the 5800 marks the start of a new era for Symbian: touch. It’s also packed with the kind of features usually associated with Nseries phones: 3.2 megapixel Zeiss camera (with auto-focus, macro and dual LED flash), 3G, WiFi, a micro-SDHC slot, and GPS. Most importantly, It’s affordable, and it’s here today! I’ve been using the Euro/Asian model (UMTS/HSDPA at 2100 MHz) for a couple months now (thanks to Molly at Nokia Blogger Relations) – the US model (UMTS/HSDPA 1900/850 MHz) will be available soon. So what makes the Nokia 5800 XpressMusic so special? As I’ve mentioned before, the 5800 is not the first Nokia touch device running Symbian, but it’s the first Nokia phone running S60v5. It’s optimized for touch and that’s a giant leap forward, especially for existing S60v3 users. The user experience may not be as visually polished or intuitive as OS X on the iPhone (which features a new interface from the ground up). but the 5800 works well one-handed, and benefits from all the power and flexibility of Symbian, with more screen real-estate than ever. Speaking of the screen: it’s gorgeous – all 640×360 pixels of it! The only downside is the resistive touch sensor. I understand the desire to cater to a broad range of markets by supporting stylus input, but this phone (like the N97) begs for a capacitive touch sensor. Are you listening, Nokia? Being an XpressMusic device, I think of the 5800 as the successor to the N81 music phone. It sounds better than most other Nokia devices I’ve used, with less background noise, less distortion, more detail and a flatter frequency response. It also features a standard 3.5 mm audio connector (with TV output) and ships with an 8 GB micro-SDHC card. The camera, while falling short of the current state-of-the-art, does a reasonable job. The 5800 takes decent pictures and records above average videos as long as you avoid shooting in low-light. When compared with the competition, the G1 camera comes ahead. The catalog of available S60v5 applications is still limited – for example, there is Qik, but not Jaiku. Of course, there’s also support for S60v3 applications, but it’s extremely limited. The implementation of touch is also hit-and-miss. I played with Google Maps, which is terrific. But Nokia’s Web browser is no match for Safari on the iPhone, despite supporting Flash! 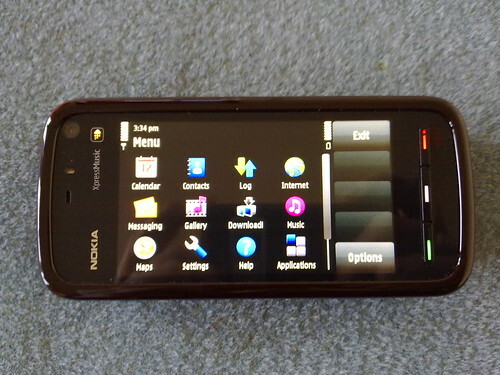 The Nokia 5800 XpressMusic represents the future of Symbian. The hardware is very nice – it’s definitely a good effort on features and price, other than the resistive touch screen and the noisy camera. If you like Symbian, I strongly suggest you take a look at the 5800. Hi , read your comments on Engadget , I’m alsoa real world blogger and recently acquired a Nokia 5800 and posted a review , along with made a carputer / in Car entertainment system out of it would love to have your comments on it . I have a Nokia 5800 XM, and I have similar experience with this phone. This review is much better than the one at Engadget. It really points out flaws and good points of a device. Hi, I’m using 5800 XM and i just want to ask where can I download google map the one that you discussed in youtube. I’m in the office right now and we are not allowed to view youtube, can you tell me? By the way, I like your reviews for various phones. thank your guys for giving us such good ideas and comment with Nokia 5800.